Click on chart for more premarket data. It seems investors may be a little more upbeat after the weekend. 1. Another bank rescue: Portugal's central bank announced it is using €4.9 billion ($6.6 billion) to rescue Banco Espirito Santo. The move involves splitting the troubled bank into a "good" and "bad" bank, and aims to protect taxpayers and bank customers. Shareholders and some bond holders will lose out. Shares in BES were suspended Monday but have slumped 87% so far this year. "If everything goes according to plan, the state should not be on the hook for any costs associated with the bailout," said Colin Bermingham, an economist at BNP Paribas. "However, uncertainties still persist so it will not be known for some time whether the Portuguese state will ultimately bear some cost." Portugal's benchmark PSI 20 index edged up by about 1% Monday, though the index has declined by 11% since the start of the year. 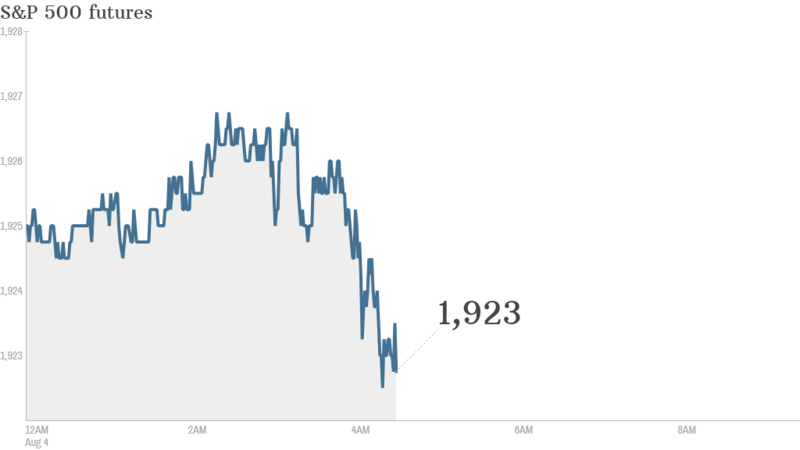 European markets seemed unfazed by the rescue package, with markets mixed in early trading. Asian markets also turned in a mixed performance. 2. Stock market movers -- Michael Kors, Berkshire Hathaway, HSBC: Shares in Michael Kors (KORS) were rising by about 4% premarket as investors hope the fashion house will report impressive earnings results ahead of the open. Shares in Warren Buffett's Berkshire Hathaway (BRKB) were rising by 2.5% after the firm reported earnings on Friday evening. HSBC (HSBC) reported results showing a decline in profit in the first half of 2014. Shares in the company were dipping in and out of the red. 3. More earnings: Loews is among the companies reporting before the opening bell. Rental car company Avis Budget Group (CAR) reports after the close. 4. Economic data: At 10 a.m. ET, the U. S Census Bureau is releasing its report on factory orders for June. At the same time the Institute for Supply Management will data on the performance of the U.S. services sector for July.